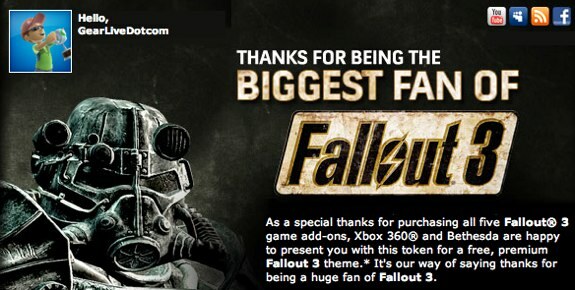 Hey, Fallout 3 fans…if you are one of the obsessed (like we were) when it came to the Fallout 3 DLC packs, you might want to check your email and spam folders. Why’s that? Well, as it turns out, if you purchased all five of the Fallout 3 DLC offerings, you should have an email in your inbox from Microsoft containing a code redeemable for a free Fallout 3 premium Xbox 360 theme. They say it’s just a thank you to the biggest fans of the game, and we think it’s a classy touch, since we totally felt we got our money’s worth from the DLC in the first place.